The Mysterious Chinese Woman and I were heading to Minneapolis to pick up a car and drive to Spirit Lake, Iowa for a short vacation with my friends Bruce and Donna. The night before Bar Man stopped at Fraunce's Tavern for a few Martinis with my friend Ronnie and I wanted a beer or two just to keep the buzz going for the flight. Sadly, not a bar was open in the terminal where I was catching my Sun Country flight. 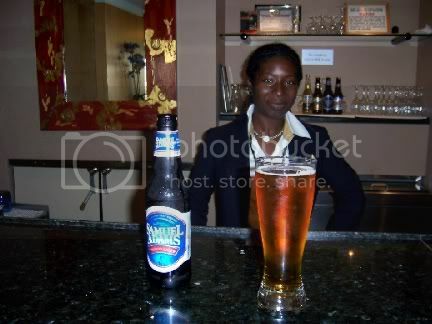 However, Bar Man is well practiced in dealing with difficulties of this type. Sun Country shares a terminal with Delta and where there is a Delta there is, ta da, a Delta Crown Room Club. Now I am not a member because I do not fly all that often anymore, but they do offer day passes for only $25.00. Now considering that this entitles you to free drinks and snacks, it isn't that bad a deal. Sadly I only had time for a couple of beers so I didn't really get my money's worth. Well, yes, I did. After all, there wasn't any alternative. The busy Tamika who worked the front desk also had to do double duty as the bartender because the one on duty was taking a potty break. Tamika was quite charming and it turns out that she lives not far from me in Brooklyn. She couldn't find a bottle opener at first (the bartender seemed to have taken it into the bathroom with her) and she rejected my suggestion that she open the bottles with her teeth. She used the old bang it on the edge of the counter trick though. Usually I carry an opener on my key chain but I put them in my bag so I could walk through security unmolested. I had a couple of Sam Adams and got back just in time for boarding. The Mysterious Chinese Woman was less then pleased that I made her stay in the boarding area with the luggage. Sometimes a Bar Man has to do what a Bar Man must do.